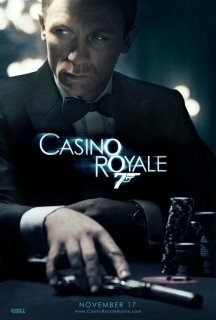 Went to see Casino Royale earlier in the week with a few friends. Really enjoyed it. If they have the courage to stick with the conviction of making Bond films that have moved on from the 70s they may well have found the way to save the series from sliding back into being action farces. It was a bit long but no matter how hard I try I can’t see where they could have cut from it. I know the romance section has been suggested but it strikes me that if they’d cut that it would have come across as one of the quick flings Bond has in so many of the other films rather than something deeper that affects him creating the colder Bond of later stories. Glad to see the heavy influence of the book on the story which expanded on it rather than steeling the title. I wasn’t bothered by the absence of Q and Miss Moneypenny who while fun had become overworked cliches. Q would have required some silly gadgets and a cliched comedy lab sequence which the film didn’t need. Moneypenny would have required a smoother Bond who isn’t the Bond of this film. I looked to see if the sound track was available but was surprised to find that it doesn’t include the theme song. A rather cynical move to promote sales of the single. Maybe a better idea would have been to release it at the same time as the film rather than in a few weeks to try for the Christmas number one. That line would have had impact anyway but by twisting their own cliche it had so much more impact. He had a few quips - which weren't the cheesy one-liners of yesteryear. I loved the response when asked how he would like his vodka martini to be mixed.